My apologies for the bad photography. I had not heard of blogging in 1997, and didn’t know this photo would be going on the internet…. I’m not going to write down the history — the be-all, end-all story of the glass bottle tree here. I’ve discovered that the story is all over the internet. And glass bottle trees are everywhere now, usually (and sadly) in the form of a designer yard ornament. I’m mostly going to tell you about our tree, and related matters. There. I’ve just saved you a lot of reading! Not exactly what we were trying for…. My late ex-wife, Sally Jo Davis and I, loved learning about and paying tribute to the planet’s different cultures. We collected Mexican, African, Native American, Indian (think India), Central American and Asian art. We liked things made by the human hand. Our house was filled with beautiful, not expensive, things which we gathered mainly in our native Pacific Northwest. We either bought things new, at street fairs or import shops, or used, at garage sales, antique malls or flea markets. When we were finally able to buy our own little house in 1997, we decided to not only decorate the inside, but to decorate the outside too. A beautiful red berry tree was growing in our front yard. (I cannot identify the tree for you. Blame the internet!) We decided to turn it into a “glass bottle tree”. 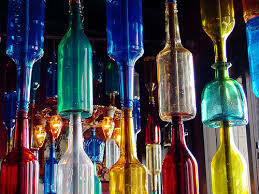 That is to say, we decided to hang pretty, colored bottles from it. 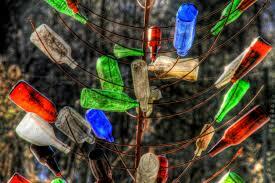 Glass bottle trees are a tradition in Africa, and also in the American South, among African-Americans. However, there are more examples in other countries. 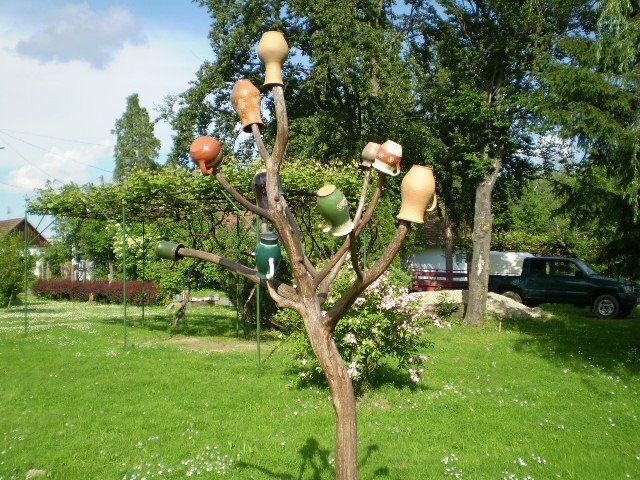 In fact, I have recently learned that Hungarians have a similar tradition called the jug tree. The traditional purpose for hanging bottles or jugs from a tree is to dispel or destroy the evil which exists in the air. In the case of the glass bottle tree, it is said that when sunlight hits the glass, and a little glint of light is produced, the evil is zapped. — I’m not saying SJ and I had that in mind when we made our tree; but we did want to pay tribute to the tradition and the culture. First, let me show you a photo of the most common type of glass bottle tree. You’ll note the bottles are shoved onto the bare branches. I imagine these trees are dead, or even artificial. Otherwise, I’m not sure what happens when they begin to sprout leaves! Sally Jo and I had a lush, live tree which we planned to decorate, and it definitely had leaves. So we decided to hang our bottles, using string. I spent a lot of time and effort hanging about two dozen bottles. However, within about two months, the string, having been exposed to our wet weather, rotted and broke. I wound up having to climb up and down a very tall ladder all over again, to rehang many bottles, which I’d found scattered all over the yard. So we learned to use nylon fishing line, for obvious reasons. Of course, before we could hang the bottles, we had to accumulate bottles. First, we started saving bottles which food products came in. 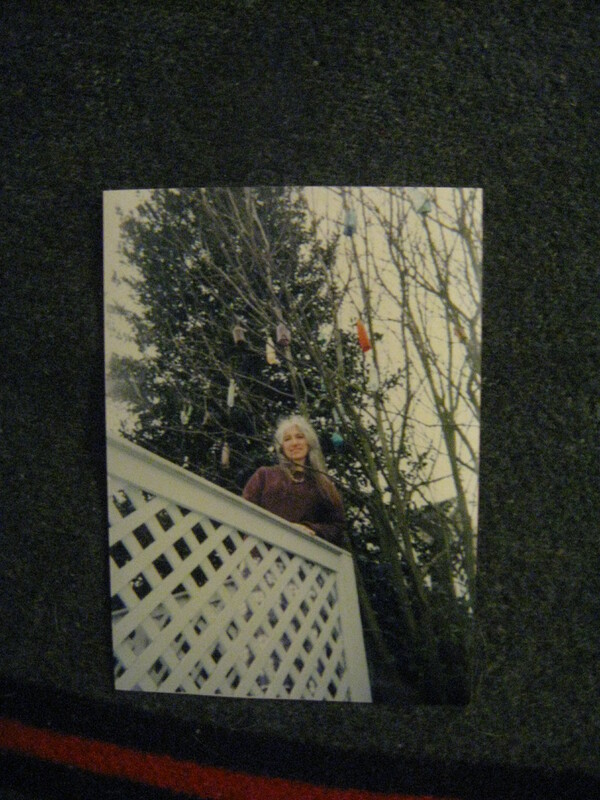 When we used something up, we washed out the bottle and hung it from the tree. Then, we began looking for used bottles at thrift shops and antique malls, and new ones at import shops. We soon learned that some “used” bottles can be very pricey. Because they aren’t used – they’re old. There’s a difference! We weren’t interested in paying collector’s prices. So we just saved our own, and bought the ones we could afford. 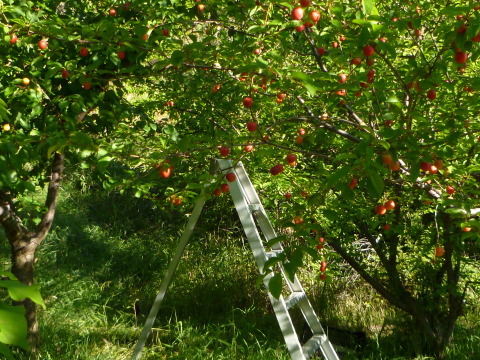 I’ve racked up countless hours working in orchards, having grown up in the agricultural community of Yakima, Washington. So I’m not afraid to be high up in a tree, among many branches. – I got used to that, years ago. — Along with the pokes and scrapes that come with the job. So Sally Jo assigned me the job of hanging the bottles. We had inherited a long ladder from our home’s previous owners. I climbed up and down many times, in order to accomplish my task. But finally, I had all the bottles on the tree. And I mentioned that I had to do it all over again when the string broke. We began taking photos of the tree, to document its beauty; plus it made a great backdrop for posing in front of. 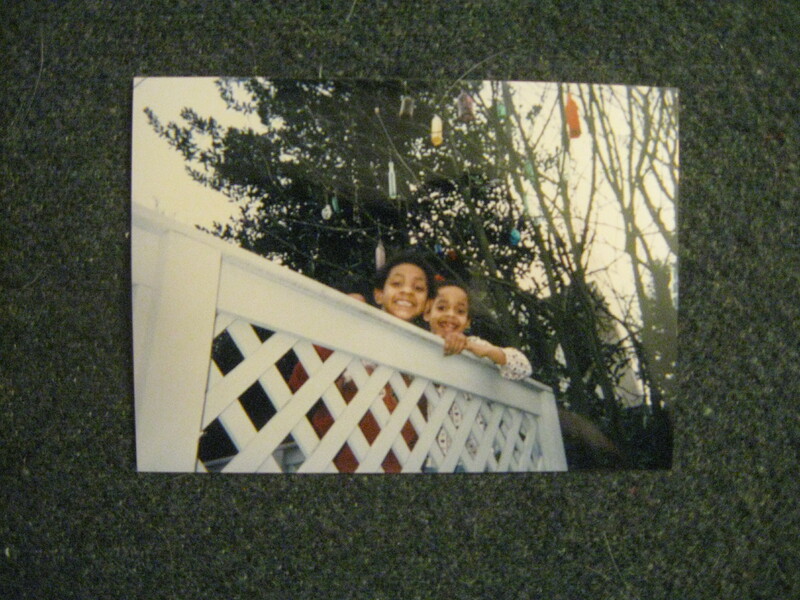 We accumulated a nice bunch of photos of the tree, plus ones of us, and the neighbor girls, posing near it. Then, a funny thing started happening: we noticed cars stopping in front of our house. Their occupants got out and took photos of our tree! We thought that was pretty neat. So we found some more bottles as soon as we could, and added those to the “display”, to make it that much more attractive. Apparently, our tree was a rare and unusual item. The internet was just catching on back then. There was so much less happening, regarding the internet. But we thought it would be good to do a search for glass bottle trees, to learn more about them. We had not thought of that, because people didn’t just “Google” things all the time, then. — Well, when we searched “glass bottle trees”, we found people were talking about ours! That was pretty exciting. 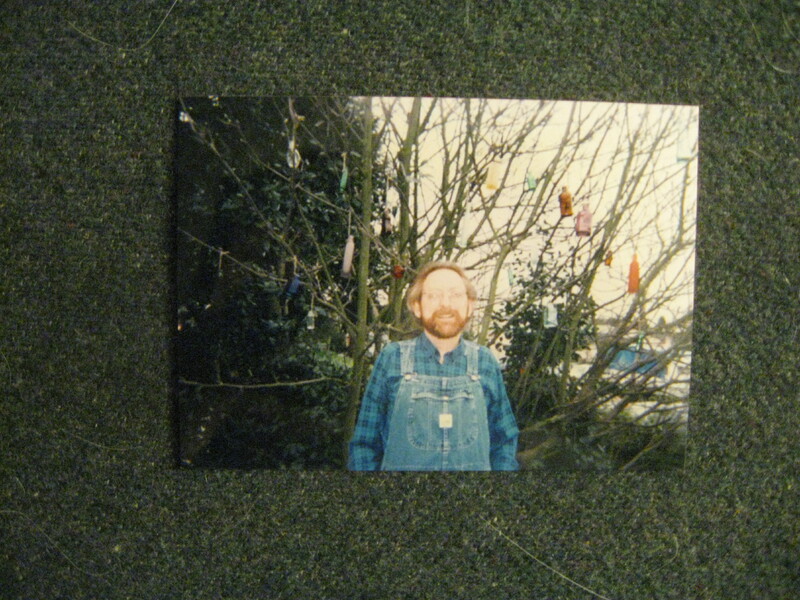 We found a photo or two of our very own glass bottle tree. We felt good that the tree not only meant something to us; it was also of value to complete strangers. We thought more and more about it, and spent more time watching it. And no, we didn’t find a lot of additional information on the subject. We did go in search of a book. 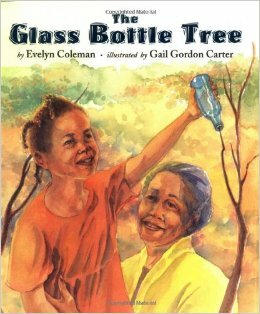 We found one: a children’s book written by Evelyn Coleman, entitled “The Glass Bottle Tree”. It told a very sweet, fictional tale of a southern, African-American girl and her family’s glass bottle tree. Well, it seems that the glass bottle tree tradition, or should I say phenomena, has moved north, and west. They’re much more common now. — I found about five bottle trees on the web when I searched in 1997. Now there are thousands of photos. 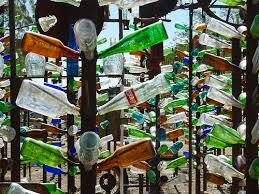 Just go to flickr, and you can view about 700 photos of many kinds of glass bottle trees on their pages. And, you can locate several, if not many, good books on the subject. 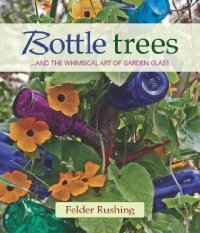 One of the best glass bottle tree books is by Felder Rushing. Mr. Rushing goes around the country, taking photos of the many beautiful examples he finds. He filled a book with them, entitled “Bottle Trees …And the Whimsical Art of Garden Glass”. 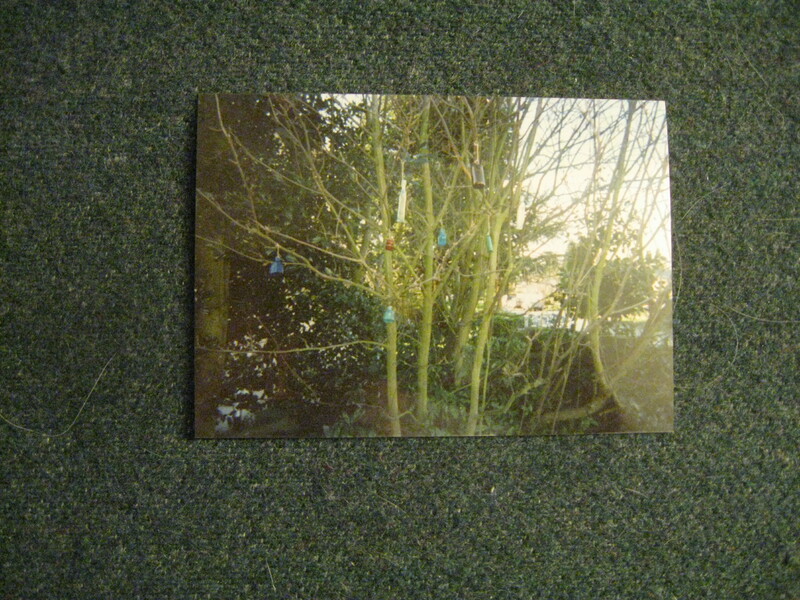 However, he published one photo of a tree which held glass telephone pole insulators, and called them recycled bottles. Not! Here are some of my telephone pole insulators, which I collect, including a beautiful, more rare purple one, plus one made of ceramic. These are not bottles. I thought the insulators looked rather odd on the tree (it’s not my photo, so I am not using it in my story.) — Someday I may do a story about telephone insulators. Let me just say they were made by the same American companies which made art glass, and kitchenware, in the 1920’s-1950’s. You will probably not see them on telephone poles now. They will be in collections or museums. (Or the occasional glass bottle tree!) I think they’re beautiful. 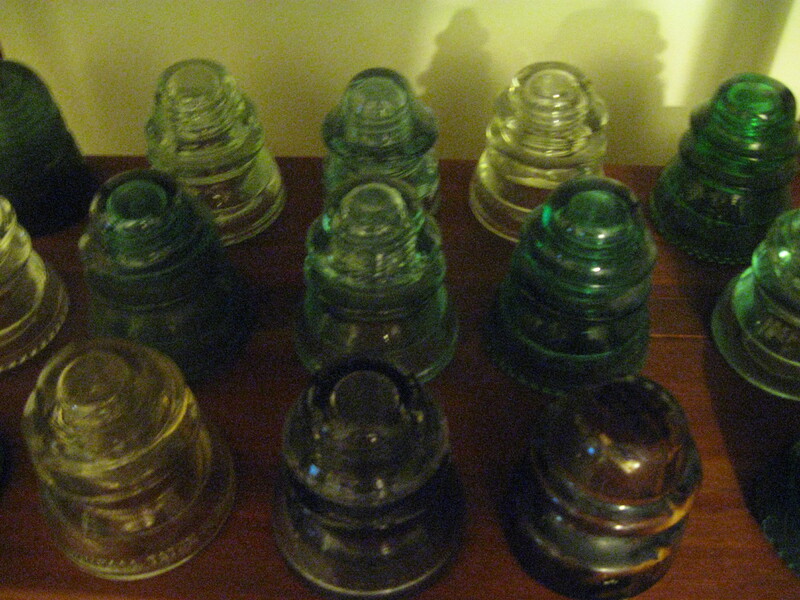 Telephone pole insulators, 1920’s-1950’s, from my collection. Not for glass bottle trees, cause I said so. Not only can you find books and photos relating to glass bottle trees, by conducting a simple internet search; but you can buy a complete kit! Yes, glass bottle trees have become a business! You can order an entire set of bottles in one swell swoop. They will soon arrive, with instructions. I think this really waters-down the whole thing. For SJ and me, half the fun was going out and finding a bottle. Or buying a product, eating it and then having the bottle as a bonus. I would not have wanted to make our tree in one day. — It just sounds too easy…. Me! Still have those overalls; a gift from Sally Jo. My favorites. And my tree was not easy. — As I mentioned, I first used string, and then nylon fishing line to hang our bottles, which I hung right-side up. Well, I recently saw a photo of a tree where the maker also tied the bottles onto the tree; but he or she hung them upside down. You know, that’s not a bad idea. Because when winter came, our bottles, which had collected water during the rainy season, started freezing and exploding! Yes. Soon, I was picking up glass shards all over the yard, in 20-30 degree weather. So I’ve learned this: if you hang your bottles right side up, find a stopper, a cork, or something that works as a stopper. — Unless you live where it doesn’t freeze. Even then, if water gets into your bottles, they may not look very attractive if dirt also finds its way in. The resulting mud is not that pretty! One day, when I was way up on the ladder, trying to tie another bottle onto a branch, the ladder gave way! I fell backwards with the ladder, and I landed very hard. I had to visit my doctor, who told me I had cracked some rib cartilage. I missed a couple of days of work, and I was sore for months! He told me the cure was a “tincture of time”. I thought that was a very colorful figure of speech — although it did nothing to alleviate my pain! — Anyway, my luck with the glass bottle tree wasn’t that great. I had seen the initial strings rot; later the bottles exploded; and then I fell to the ground and hurt myself. — I guess I can say I would do anything for art. And hey! There was no evil in the air! I’m sorry to say that Sally Jo and I divorced in 2000. We sold the house. I took all the bottles from the tree. Sally Jo told me to keep them. 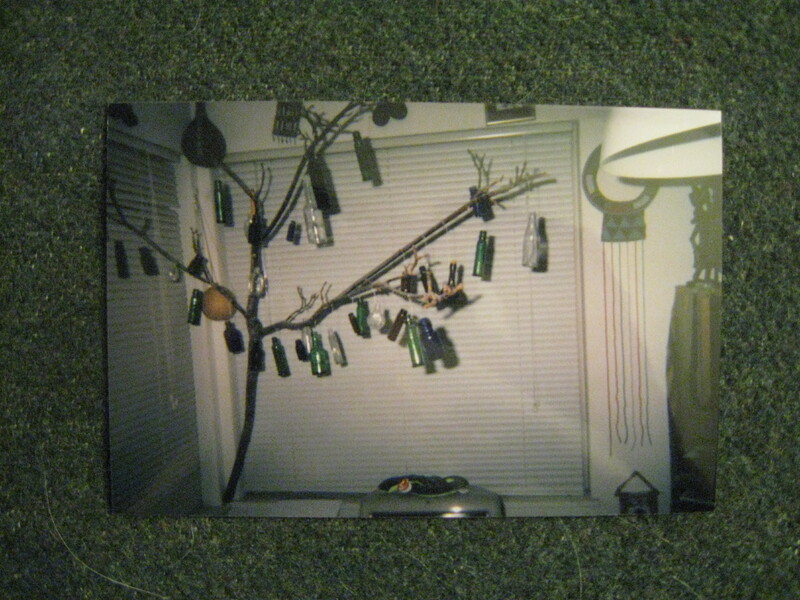 However, I moved into an apartment, which had no tree which I could utilize to make another glass bottle tree. I gave away all of the big ones to my friend Shelly, keeping only the little ones. I started collecting all over again; only this time I collected small ones. And one day, while walking to the store, I found a good-sized branch which had been torn from a tree during a storm. It was just what I was looking for. I soon mounted the branch in my apartment, and hung all of my pretty little bottles from it. It doesn’t look too good against the generic apartment blinds…. I loved my little indoor glass bottle tree. I enjoyed it for eleven years. Then, my apartment building caught fire, and I had to move. There was no room for the branch in my new, smaller place. So I gave those bottles to Shelly. 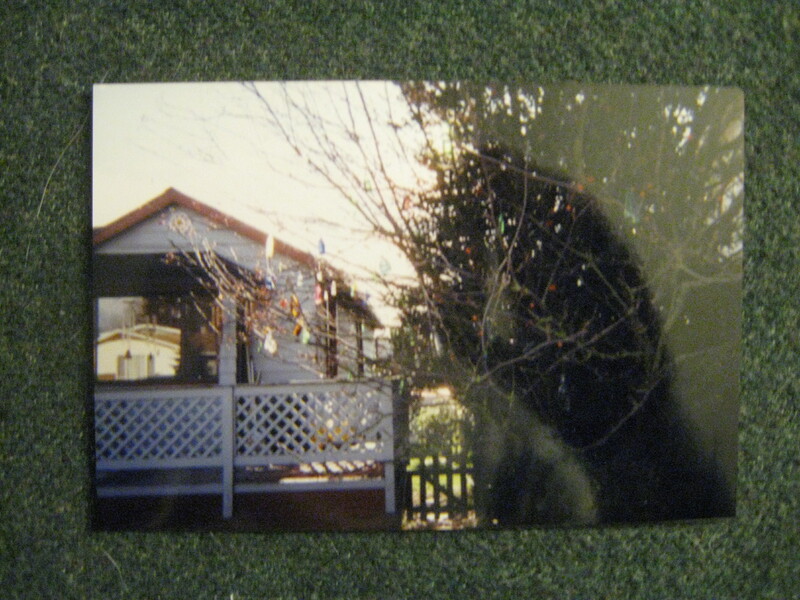 I no longer have a glass bottle tree, but I have my memories, and photos. In anticipation of writing this story, I recently searched the web to see if I could find someone else’s photo of our tree, because my photos are pretty poor. Or, I was hoping to find an article about our tree, from back then. But all of those photos, and that writing, seems to be gone. That was 1997 – nearly twenty years ago. Sally Jo Davis passed away in January 2015. R.I.P. My Hungarian friend/surrogate nephew, Peter Garami, provided me with some information about the Hungarian jug tree. Here is a photo of one, which he found for me. (Thanks, Peter!) Peter shared this information: the jug tree is made on St. George’s day (April 24). This day marks the agricultural end of winter. The jug tree is just one of the many traditions of this day. These traditions are to chase away the evil spirit of winter; but more, they’re the symbols of the rebirth of nature for the forthcoming year. Nowadays, jug trees are also serving a decorative purpose, and they remain up on a year-round basis. Additionally, Peter shared a very ingenious use of the jug tree: they were used long ago, before the invention of dish soap, to help families keep their food containers clean. By hanging the jugs on a tree, they were exposed to UV rays, which killed germs. — I think the one pictured here is very pretty. If you visit YouTube, you can find a couple of songs about glass bottle trees. I wasn’t impressed with either of them enough to want to post them here. Although the performances were good. I just didn’t think either song fit well with my story. Maybe I’ll write one someday! 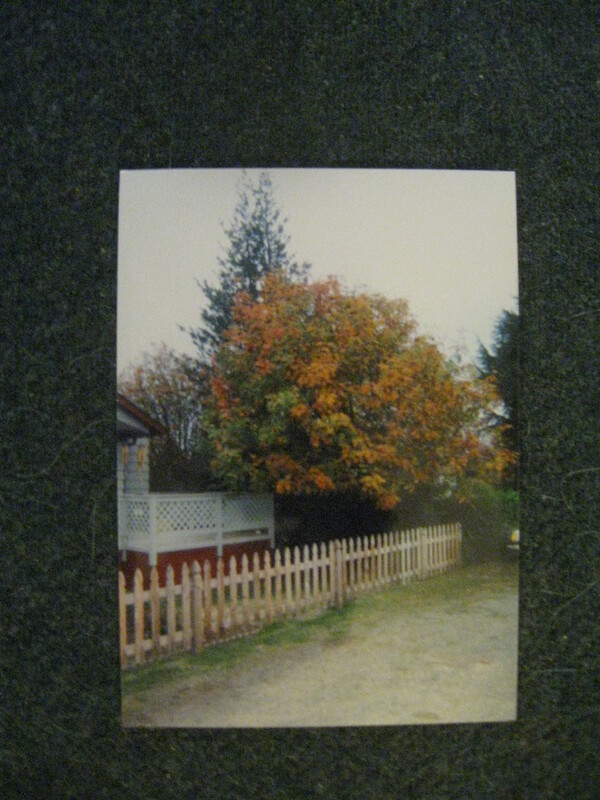 Here’s a photo of the tree in fall. It’s pretty even if you can’t see the bottles!